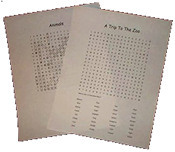 Easily make two styles of crossword puzzles, each using your words! Try the demo now and see for yourself why Crossword Weaver is the leading crossword puzzle maker! Quickle create word search puzzles using your words. With 1-2-3 Word Search Maker, it's so easy! Try the free demo and see for yourself! Welcome Puzzle Lovers! You have come to the right place! We have a large collection of fun puzzles to print and play, and some you can play online right now!. Choose your favorites! Do you like traditional newspaper-style crossword puzzles? More puzzles just added! Or perhaps you prefer the free-form, or criss-cross crosswords. Then there's my favorite--word search puzzles! Bonus: Now play online! If you love cryptograms, you need to check out these puzzles! Great mazes to print and play. Lots of variety too! Math Squares! Get the numbers to add up goimg across and down! Kids Corner! Check out fun puzzles just for kids! A great gift idea for that special someone. A puzzle made just for them! Learn more! If you want to use puzzles for any other purpose, please visit CrosswordWeaver.com or WordSearchMaker.com and make your own puzzles that you will own and can use for any purpose, even commercially. As for the puzzles on PuzzleMeSilly, publishing them in any format, including but not limited to print or electronic, is not allowed. If you would like to link to our site you may, but copying or hijacking pages or graphics is prohibited.